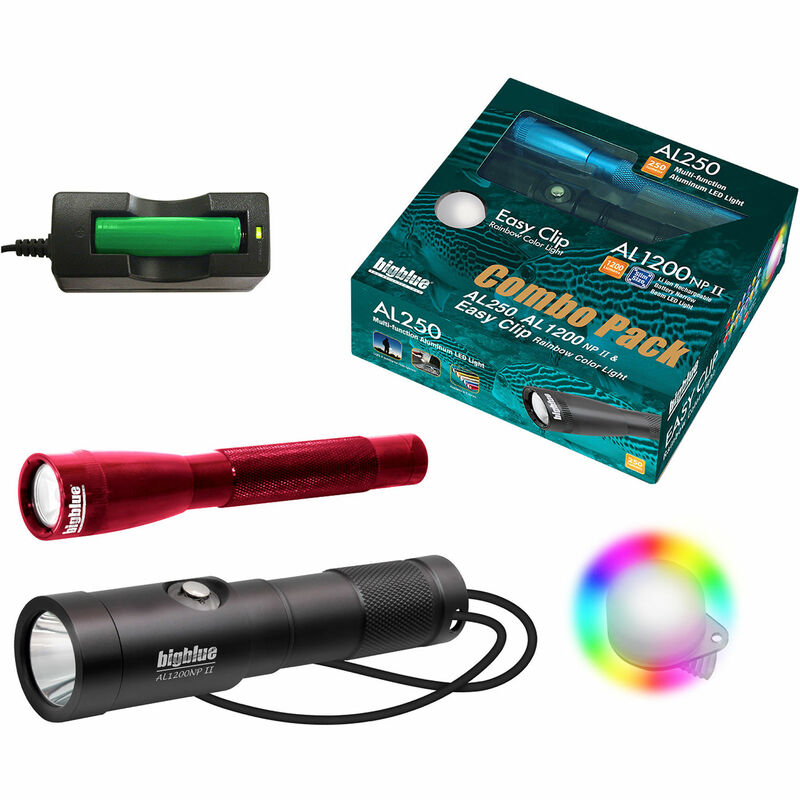 The Combo Pack: Red AL250 & AL1200NP-II Dive Lights with Rainbow Clip meets a wide range of diving needs, with two dive lights and a rainbow-flashing marker, all depth-rated to 328'. The black AL250 is a compact, 250-lumen LED light that runs on two AA batteries, turns on and off with a head-twist switch and shines a tightly focused 8° beam for close-up detail work. The rechargeable AL1200NP-II LED light delivers a narrow 10° beam with four output levels from 120-1200 lumens. Both lights have anti-corrosion anodized aluminum housings, and both are suitable for use on dry land. Light up your path on land or underwater with the blue AL250 Multi Function LED Light from Bigblue Dive Lights. Featuring a 6500K XPG LED light source with an 8° beam angle, this compact 250-lumen illuminator is powerful enough for use as a primary light when diving or doing other outdoor activities such as camping, hiking, running, or fishing. Its aluminum alloy housing features a corrosion-resistant blue anodized finish, while double o-ring seals provide a 328' depth rating. This versatile light supports both alkaline and rechargeable Ni-MH battery chemistries and has a two-hour maximum burn time. Illuminate the underwater world at depths as great as 328' with Bigblue's AL1200NP Narrow-Beam LED Dive Light. Its XML white LED outputs 120-1200 lumens in four selectable levels. Power is provided by a rechargeable lithium-ion battery pack, which gives the light a run time of 2.0-20 hours depending on the brightness level. The AL1200NP's narrow 10° beam is great for focusing, exploring tight spaces, and examining sea life up close. A daylight-balanced 6500K color temperature helps restore hues that get absorbed by water, so you can bring color accuracy and richness back to your images. Built for durability, especially resistance to corrosion, the light has a housing constructed from anodized aluminum and an emitter window made of tempered optical glass. A push-button body switch enables you to power the light on or off and cycle through output levels, while a battery indicator shows the remaining power level. Identify and keep track of your diving partners at depths as great as 328' with the Bigblue Easy Clip Multi-Color Rainbow Marker Light. This beacon features virtually all the colors of the visible spectrum: red, green, blue, purple, orange, and yellow. Additionally, it provides both constant and flash modes for all these colors. The light output is bright enough to be seen by other divers, yet low enough that it won't be distracting. Running on the two supplied CR2032 coin batteries, the marker light has an operating time of 12-24 h. It clips easily onto masks, belts, straps, and other accessories, and includes an adjustable lanyard that will attach to tank valves and buoyancy compensation devices. Box Dimensions (LxWxH) 6.7 x 1.7 x 1.6"
Box Dimensions (LxWxH) 7.4 x 5.9 x 2.6"
Box Dimensions (LxWxH) 2.4 x 2.1 x 0.6"